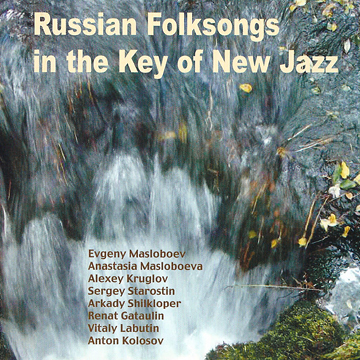 Алексей Круглов и Круглый Бенд - "Russian Folksongs in the Key of New Jazz"
Главная Дискография "Russian Folksongs in the Key of New Jazz"
Во второй половине декабря 2013 года британской компанией Leo Records издан альбом "Russian Folksongs in the Key of New Jazz". В записи принимают участие Евгений и Анастасия Маслобоевы, Алексей Круглов, Сергей Старостин, Аркадий Шилклопер, Ренат Гатаулин, приглашенные гости - Виталий Лабутин и Антон Колосов. Запись была сделана в московском Культурном Центре Дом 30 апреля и 1 мая 2012 года. The idea to record this CD came about in April, 2012, when Evgeny and Anastasia Masloboevs flew to Moscow from Irkutsk for a couple of days. We invited some musicians who were in the city and spent two wonderful days in the Cultural Centre DOM recording the project. While recording, we realized that we came very close to uniting several things – folk music, improvised music and live electronics. It was very interesting to look for and develop new images in the context of these different styles. I feel that using combinations of different instruments we managed to achieve a natural blend of all these styles and find something new. I also feel that we managed to tell the story of creating this album and every listener of whatever musical persuasion will find something for himself. Musicians would like to thank Maxim Khaikin, Cyrill Starikov, Sergey Kazarnovsky, Vladimir Kruglov, Cyrill Moshkov, Anna Filipieva, magazine “Jazz. Ru”, Daniil Mukhamedyarov.